IN A CERTAIN SENSE, LIFE BEGINS WITH BAPTISM. FOR WITH baptism we begin life with a kind of God-given perfection. But from then on to the grave, we are subject to countless conflicting possibilities and powers for good and for evil which we have to co-ordinate if our lives are to become integrated, if we are to achieve and maintain our integrity. 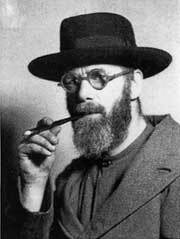 It is this sense of lifelong consistency of mind and heart for truth and goodness that characterized the career of Eric Gill. His life, in his words and in his deeds, while of course not always perfect, were intact and complete. And in our modern way of living a departmentalized life, a life divided into separate compartments-our home life one thing, our work life another, our leisure life still another, and our religion something apart from all of them-we whose lives are disjointed and full of compromises and contradictions, can and should learn more than just admiration for the integrity of Eric Gill. Christened Arthur Eric Gill, he was born in Brighton, England, in 1882. He was the second of the thirteen children of a minister of a religious sect founded by the Countess of Huntingdon. The sect was so small and its doctrines so vague that one writer referred to it as having three persons and no God. But like so many-witticisms, this one was not true. Eric's parents were so sincerely religious minded that he never lost his grasp on the eternal verities, even though in a later period, for reasons which will be explained, his grip was weakened. And even then, he never fouled his family n\est by recrimination. As could be expected under the circumstances, his family was poor. Poor but upright and cultured and loyal and happy. And that was the starting point of Eric's lifelong crusade against men or even nations dedicating themselves to the amassing of material wealth. Yes, nations too; for he was never deceived by the bringing of the blessings of civilization to benighted countries which just happened to have rich natural resources, where the white man's burden consisted chiefly in shipping them home. Eric's formal education consisted of six years at a private school in Brighton and two years at an art school in Chichester. He was weak in speculative subjects; strong in those he thought worth doing for their own sake, chiefly mathematics and drawing. While at art school, he joined his parents in becoming a member of the Church of England. And so he was an Anglican when he soon afterwards became apprenticed to a London firm of architects which engaged largely in ecclesiastical building. He was there but a short time when he lost his faith in what was called religion and lost faith in what was called art. On the one hand, the unnatural and tyrannical division of labor which reduced the builder to a mere copying of things designed on paper to the smallest detail by ponderous, pompous artists who held religion in tolerant contempt while making a living off it, and, on the other, the self-centered, softcushioned Anglican clergymen and their indifference to the intellectual, moral, and physical well being of the people -these among other things drove the young man into a vague and hungry agnosticism. He had thought that God meant a Supreme Being to be proudly loved and served and he had thought that architecture meant building. But, while he lost his illusions, he did not lose his head. He left his fictitious world and began to build a real world for himself. He wanted to be a workman, with a workman's rights and duties, to design what was to be made and to make what he had designed. An artist, he held, is not a special kind of man, but every man is a special kind of artist. What work could he do that was wanted? He soon found it: letter cutting in stone. He studied lettering under the great Edward Johnston and after a year got his first small commission, and from that day on was never out of a job. And he just walked out of the architect's office. It is an evidence of the fact that his supposed agnosticism was just youthful bewilderment at the abuses of religion which he had witnessed that it was at about this time that Gill formulated the idea of his philosophy of work which began with the idea of God. In sorites or extended syllogistic form, it ran something like this: God is first of all to us the Creator, first, for it is to that power in Him that we owe our very existence as well as that of all the rest of the world in which we live. But God said that He created man in His own image and likeness. Therefore God intended man to be primarily a creator. But a creator is one who makes at least an appreciable part of a thing and who controls the means of its making. Therefore assembly-line mass-production in particular and our modern mechanized industrialism in general are contrary to man's nature as God created him. We should need no elaboration-much less proof-of Gill's reasoning. Have you ever met an assembly-line worker, seeing one of his company's finished products, and commenting on the quality of the job he did? And we see the results: workers with one eye on the clock and the other on the paycheck, and their hearts, in beer-gardens to help them forget the kind of work that gives them no satisfaction of accomplishment, work that makes them servants rather than masters of machines, work that leaves them old at forty. Flowing naturally from this philosophy of work, of man as a creator, as a maker, was Gill's doctrine on the matter of the ownership of private property. Contrary to prevalent opinion, he held that it was not primarily a moral right, one flowing from man's free will. Gill denied that it was as a moral being that man had a right to private ownership. That right, he held, came primarily from man's material necessities and man's intellectual nature, deriving not from his need to use things but from his need to make things. It is, then, to man as workman, as an intelligent being who must manipulate things in order to make them serviceable, that private ownership is both necessary and a natural right, and only when there is control of the means of production can there be proper and efficient production. Unless a man-be he a farmer, a miner, a craftsman, an artist, a laborer-unless he own, either individually or jointly with others, the field or mine or other necessary property or materials, he cannot properly control his work. This necessity of manipulation it is, according to Gill, which gives the right of private property in the means of production. Maritain has put this truth in philosophical terminology: "The exercise of art or work, whether it be that of craftsman or manual laborer, is the formal reason of individual appropriation." It is obvious that, as things are here and now, the only grounds upon which productive goods can be validly made, have to a great extent been destroyed. The factory worker, for example, can make no claim to private ownership and the big machine industries and the utilities are not private industries-they are, as they publicly boast, public services; and hence they are fair prey to socialists and communists for what are public services should be publicly owned for the profit of all. Bonds, bonuses, money in the bank, even profits sharing are not ownership, they are not control of the means of production, they do not restore the intellectual operation of the workman by which he imprints on matter the mark of rational being. This is the philosophy of the Distributists to which Belloc, Penty, Pepler, McNabb, the Chestertons, and scores of other leading thinkers, Catholic and non-Catholic, subscribed. The only possible reform of our world, Gill believed, must begin with the distribution of ownership. In 1904, Gill married Mary Ethel Moore, a clergyman's daughter, and set up housekeeping in a block of workmen's dwellings in the London suburb of Battersea. Soon after the birth of their second daughter, they moved to Ditchling in their native county of Sussex. There was no back-to-the-land sentiment behind this, though Gill always loved the earth, and especially "the earth that man has loved for his daily bread and the pathos of his plight." What was behind the move was the conviction that crowded city quarters were no place to raise children. For to Gill, marriage meant babies-if it were not for babies, he once asked, would there be any more marriages?" He also believed that the coming of children aided in their parents' development of character: the father, for example, was no longer simply concerned with what conditions were best for his work or even for his personal comfort,-he became concerned with what conditions were best for a growing family. In 1909, Gill interrupted his successful inscription-cutting business to carve a female figure in stone. His first sculpture. Most sculptors, at least at that time, modeled their statuary, building it up in clay, and then have this model reproduced in stone by a professional carver with various machines and gadgets. Gill carved his subject himself directly out of the stone. Moreover, he thought in terms of stone (not of clay) and of carving (not of modeling). In his Autobiography he records the event in these words: "So all without knowing it, I was making a little revolution. I was reuniting what never should have been separated: the artist as a man of imagination and the artist as a workman. I was really like the child who said, First I think and then I draw my think-in contrast with the art-student who must say, First I look and then I draw my look. At first the art critics didn't believe it. How could they? They thought I was putting up a stunt -being archaic on purpose. Whereas the real and complete truth was that I was completely ignorant of all their art stuff and was childishly doing my utmost to copy accurately in stone what I saw in my head." Despite this misunderstanding, the art world soon opened its doors to receive him. But before it could close them behind him, he escaped. He found the atmosphere stuffy with aesthetes, dillitantes, poseurs, and agnostics. He returned to his home and family and work, and he began to examine his own relations to God. The religions he had known were ineffectual, insufficient, and warring among themselves. So he set about making up a religion for himself, or rather, a metaphysic, a preamble to religion. And then he began to discover, slowly and gradually, that his new invention was an old one. Invention, in its old meaning, of course,-to discover, to come up with, to find. For man can approach faith through reason but not fully apprehend it. Belief in God means that you believe Him, that you accept His revelation. Of this experience Gill said: "I found a thing in my mind and I opened my eyes and found it in front of me. You don't become a Catholic by joining the Church; you join the Church because you are a Catholic." It is interesting to recall the similarity of Gill's expression to Chesterton's when he entered the Church some nine years later. The importance that Gill attached to his reception into the Church is indicated by the fact that he concludes his Autobiography with the record of that event. The remaining third of the book he designated as a Postscript. For the next four years, 1913 to 1917, he was engaged principally in carving the Stations of the Cross for Westminster Cathedral, the work which put him in the front rank of contemporary English sculptors. Then in 1918, he was conscripted into the British army. His stint was brief-only four months, and entirely on the home front. But it helped him to formulate his opinions regarding Christians engaged in organized violence at the behest of the civil power. He was not a pacifist, as he has sometimes been called. He believed a just war possible, and hence one in which a Christian man could be obliged even in Christian charity to engage in. But he found it increasingly difficult to understand how one could be fighting for justice when the powers that attack each other are economic and financial powers, unrelated to the moral law, and unredeemed by Christianity. Modern war, he maintained, is mainly about money. And he carved his belief in stone by choosing as his subject for the facade of the war memorial at Leeds the scene of Christ driving the money-changers out of the Temple. With the recently deceased Hilarry Pepler, Gill founded the still-existing community of Catholic workmen at Ditchling. Although the community adopted the Rule of the Third Order of St. Dominic, it was not in the strict sense a religious community: its members remained laymen and they took no vows. They lived in their own private dwellings and, after Mass and Communion each morning, they went to their separate labors. The basic principle of their life was poverty, voluntary poverty; not penury or want for the necessities of decent human living, but a spirit of detachment from material possessions. Money as a means, not an end. Absurd? Do you know anyone dedicated to amassing material possessions who has peace ? Do you know of any nation so dedicated which has peace? For at least in this all the nations are united: all our modern politics are based on a denial of the Gospel. Capitalism is based on the notion that those who have money have the duty to get more, and that who have none must be enslaved, or exploited or employed-until machines make their very existence unnecessary. Fascism aims at creating empires as rich and great as the others. Communism wants to make the rich poor in order that the poor may become rich. But the Gospel of God wants the rich to be poor and the poor holy. That is the peace that Christ promised. That is the peace that Gill sought-to be detached and free, and so to possess his soul in peace. That was the ultimate secret of the integrity at which he aimed. Following a brief illness, he died in a London hospital on a November night in 1940, during the second World War. In fact, there was taking place overhead at the time an alr raid.